Hearing the name Porto evokes the image of sitting by the Douro River, sipping a glass of the country’s famous sweet Port wine, watching the iconic Rabelo Boats lazily float by. That’s why we picked the second largest city in Portugal as our final stop. We love incorporating wine tours into our plans when we visit new places, and it didn’t seem right to leave Portugal without a trip to the region that produces a significant amount of wine. We didn’t expect to live out our vision of wine by the water (it was almost January, after all! 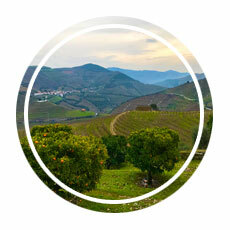 ), so Porto became a great launching pad for a trip to the Douro Valley and also to Braga and Guimarães. We did leave time to see Porto, though—a whole day, in fact. But that day was New Year’s Day, a national holiday that, like much of the rest of the world, is celebrated by shuttering businesses and enjoying time with friends and family. That left us with one whole day to navigate quiet streets and find some way to occupy our time. 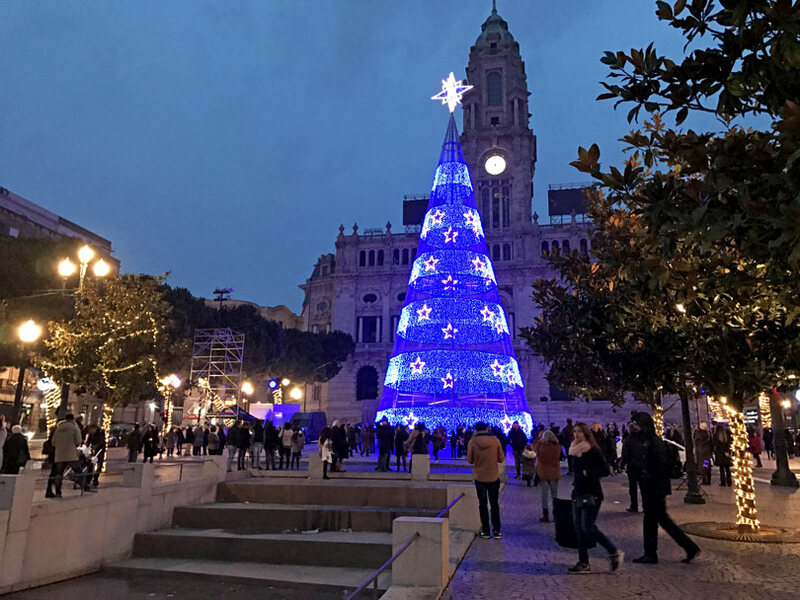 But before we faced that challenge, we celebrated New Year’s Eve in Porto. This trip marked our third consecutive year celebrating New Year’s Eve in a foreign city (Cape Town’s huge city party and Reykjavik’s bonfires and fireworks were our previous destinations). 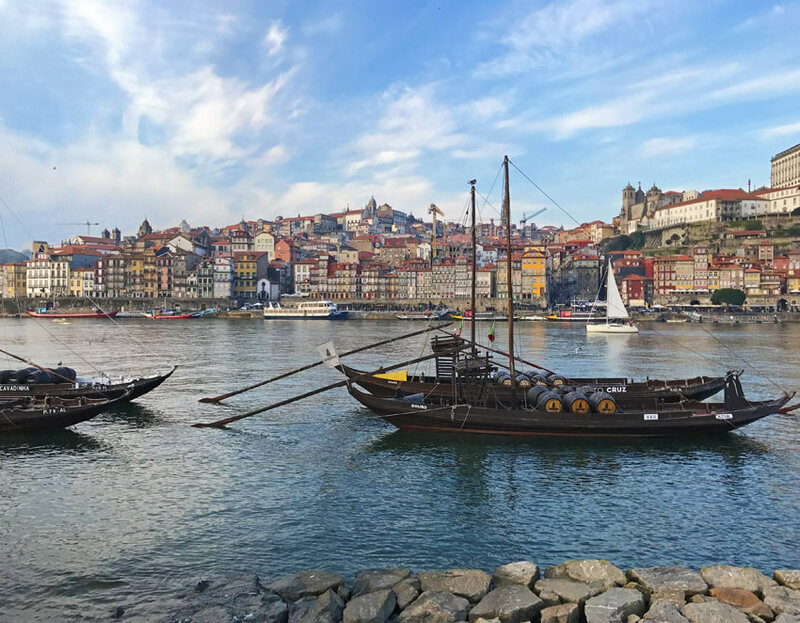 We did some research on how to spend our evening beforehand, but outside of Douro River cruises we came up somewhat empty—and spending a cold night on a boat was not something we wanted to do. While at lunch in Braga we asked our guide Yorick about our options for the evening, and he told us there were two primary places to consider: the first was the big outdoor party by Liberdade Square with music and fireworks just around the corner from our hotel, and the second involved finding a nice vantage point by the bridge where we could photograph the fireworks over the city. We love landscapes more than parties these days, so that was an easy decision to make. New Year’s Eve fireworks over Porto. This was our view from the Mosteiro da Serra do Pilar viewing deck. Get there early for a good spot- it filled fast. We arrived back from Guimarães late in the day, so it wasn’t long before we were back outside in search of our perfect spot. 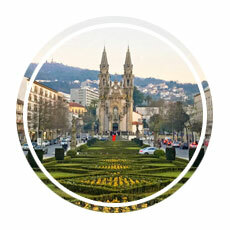 Adam had spent some time studying Google Maps in the warmth of our hotel room, and he planned a route that would take us to the other side of the river and up to the viewing deck of Mosteiro da Serra do Pilar (Google Maps Location), a monastery that sits high above Porto. Our walk across the river was a bit disconcerting; we seemed to be the only people walking away from the party, which made us wonder if the locals just knew something we didn’t. After crossing the bridge, the monastery was a quick, slightly steep climb for us, and we were immediately greeted with sweeping views of the city and even a bit of a peek at the concert and huge screens that projected the performers. It was just after 11 PM, and we thought it was a bit strange that the viewing deck was somewhat deserted; South Africa and Iceland both boasted much bigger crowds so close to midnight. In this case, the locals did know something we didn’t think of—it was really, really cold out, and they didn’t arrive to watch the fireworks until much closer to midnight. Those who arrived early sat in their parked cars, and I put some serious thought into whether my Portuguese was strong enough to tap on someone’s window and ask if we could sit in the backseat to warm up for a while. Eventually, though, midnight crept closer, and the crowds turned up in huge numbers. However, by the time we were shoulder to shoulder with all of the people clamoring for a good view, Adam and I felt like ice cubes. From so high up over Porto, the wind was chilling and steady, and even in winter jackets we didn’t feel that we dressed warmly enough. At the stroke of midnight, though, we briefly forgot just how cold we were as fireworks erupted over Liberdade Square on the other side of the Douro River. 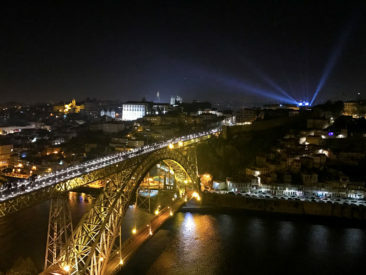 We made a great choice to find a good vantage point above Porto to capture both the fireworks and the beautiful cityscape. The fireworks show was impressive and lasted more than 20 minutes, so by the time it concluded we were more than ready to return to the warmth of our hotel room. The wind felt even colder when we crossed the bridge the second time, and I could barely feel my face as we walked into our hotel’s lobby. All worth it in the end, though; the chill wore off quickly, but the memories and beautiful pictures were well worth an hour or so of discomfort! We slept in on New Year’s Day (a huge treat for us—usually our itineraries have us waking up really early to get our start), so when we emerged into the daylight we were somewhat refreshed and really excited to start exploring. Livraria Lello. Sadly, it was closed. We started with a brisk walk to Livraria Lello, the bookstore with an incredible staircase that inspired the library in the Harry Potter series. I happen to share a birthday with Harry Potter (and J.K. Rowling), which made it even more meaningful for me to stand on the doorstep of a place so influential to a series that captivated me for so long. Sadly, the doorstep was as far as I was destined to make it (the bookstore was closed for the holiday), so with one strike against us, Adam and I decided to regroup over lunch. It wasn’t quite noon yet, but our lunch options were limited to say the least. The first open spot we found was a bakery, but we wanted something more substantial than pastries. Further down the road we found a full service restaurant, but I was immediately put off by the set of menus they had, each bearing a different country flag to indicate the language it was printed in, with pictures of lifeless lasagna and burned burgers. I rejected this place, too, which meant we were still on the hunt for our next meal. We eventually decided to walk in the direction of the wine cellars (where we planned to spend the balance of our day) and pick a place along the route. 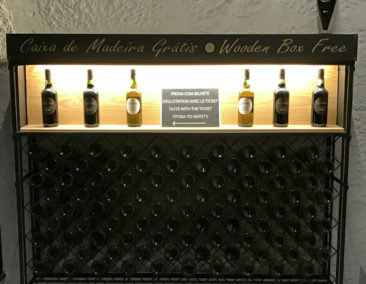 Because we love to explore side streets and generally avoid taking taxis or even public transportation if a reasonable walking route is available, we knew the wine caves were about 45 minutes away, which meant 45 minutes of opportunities to find lunch. Thanks to the holiday, though, our route ended up being a scenic tour of all of the restaurants that were closed for the day. I could feel my stomach grumbling with every step as we crossed the bridge. After about five minutes of nice, flat, paved streets, Google Maps directed us up an incredibly long, steep hill (so long and steep, in fact, we took a water break part of the way up to give our sore legs a minute to recover). By now we were well into a residential area with absolutely no hope of finding a lunch spot, so we resigned ourselves to wine tasting on empty stomachs. I considered this our second strike; if we encountered one more I felt like I might throw in the towel entirely. 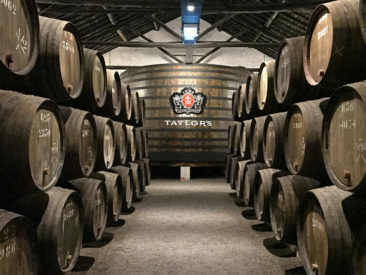 Our destination was Taylor’s, one of the most well-known and distinguished wine cellars in Porto (it came highly recommended from other travellers). Their website indicated they were open on New Year’s Day, so I felt confident that, if a third strike were in our future, it wouldn’t be there. We walked onto the property and audibly cheered when we saw they not only had a tasting room, they had a restaurant! We walked in and were seated immediately (though it seemed arriving without a reservation was an issue at first, the hostess was very happy to accommodate us). They offered a prix fixe menu, which we were very happy to order, and we savored an aperitif (dry white port) paired with olives, fresh bread and cheese, and prawns. All of this was followed by a creamy poultry spread served in a puff pastry, seafood pasta (for Adam) and roast duck with red fruit (for me), and decadent chocolate cake with espresso to complete the meal. We also got to select a glass of red or white wine to sip during the first courses, so between us we ordered a glass of each (both were lovely!). I caught myself smiling as we left to explore Taylor’s wine cellar—just when it looked like we wouldn’t have any lunch options at all, we wound up starting the year with an incredible four course gourmet meal. Good things come to those who wait! We took Taylor’s self-guided tour of the wine caves that walked us through the history of the establishment, the port making process, and a history of port in Portugal before delivering us to a tasting room where we again sampled the white port as well as a ruby. 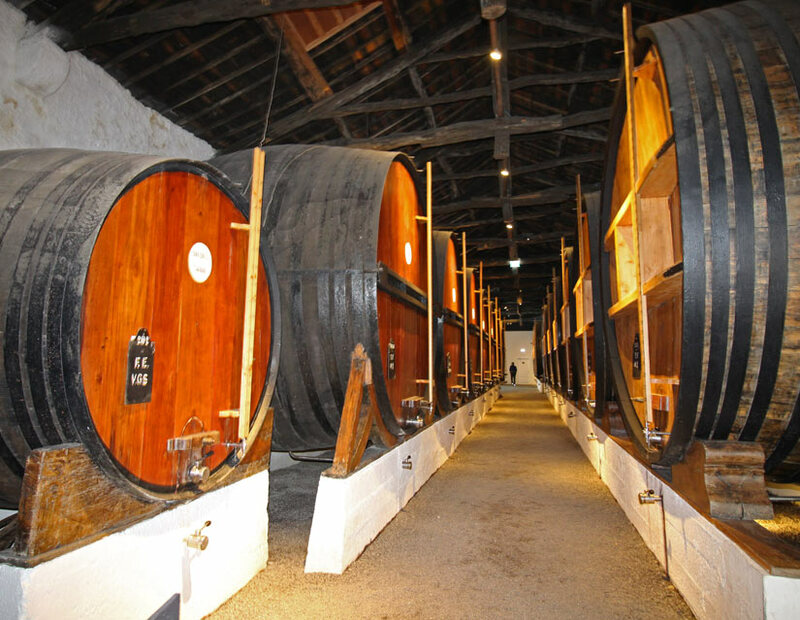 For visitors not familiar with winemaking, the tour would be fantastic; it’s an audio tour designed to take more than an hour, so the information shared is very thorough. We skipped a good deal of the audio commentary because we know quite a bit about winemaking from previous wine tours (the port production process really isn’t very different), but we thought the visuals presented through pictures, charts, and videos were great. The enormous wine barrels were also fun to see. From Taylor’s we walked closer to the waterfront, where to our great surprise the city had come to life! It seemed all of Porto slept through lunch and woke up to open shops in the mid-afternoon. While many of the wine cellars were closed for the day, shops and restaurants were open, so we treated ourselves to small cups of gelato and sat by the water to eat them. While I had expected wine by the water when I first thought of Porto, ice cream by the water was a perfectly serviceable alternative. The sun was beginning to set, so we thought it was a good time to venture back to the other side of the river for the evening. We bought two one-way tickets on the teleférico, and they came with a complimentary glass of port from a wine cellar we hadn’t passed on our walk. The line to take the cable car was long, so we crossed the street to visit Quevado. 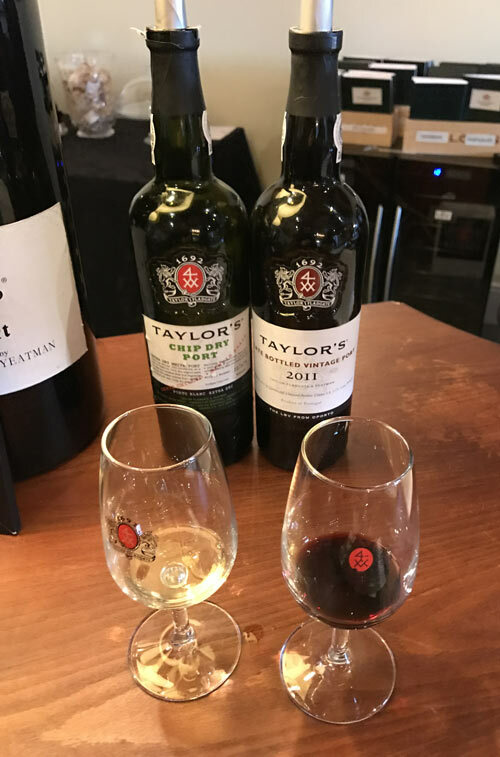 We quickly received our port, a very nice tawny, and it seemed just as quick that we finished our glasses and returned to the cable car. The line had completely vanished, so we were ushered into a car and returned back to the top of the hill within minutes. We spent the rest of the evening somewhat aimlessly wandering around, admiring the older buildings and relaxing for a bit in front of the Christmas tree in Liberdad Square, which was much quieter than it had been the night before when scores of people filled it for the concert and fireworks. On our way back to our hotel, we stopped in front of a packed McDonald’s with a huge bronze bald eagle that sat above its door. It was easily one of the most American things we had ever seen, and we were a whole ocean away from home. 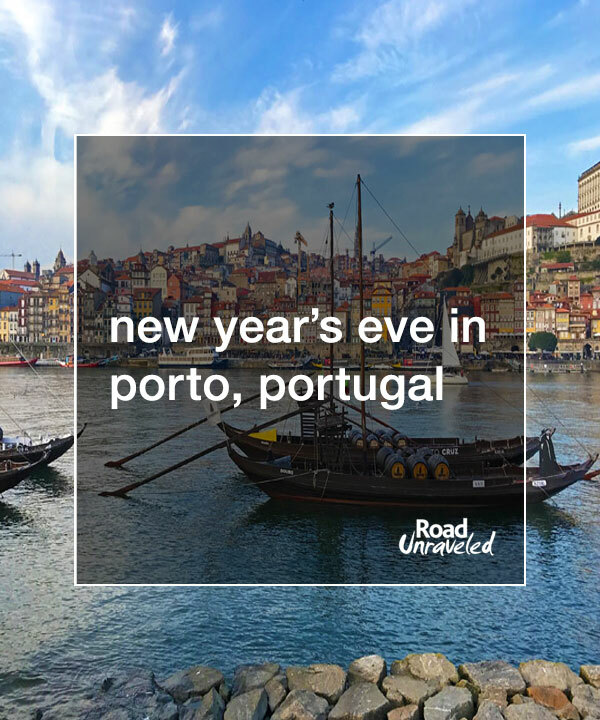 Visit Porto for New Year’s Eve! I’ll be the first to admit holidays can be difficult to navigate when you are visiting a foreign city. We encountered all of the classic issues: many places were closed, and our options were limited. Our time in Porto was great despite the issues, though—maybe even because of them. 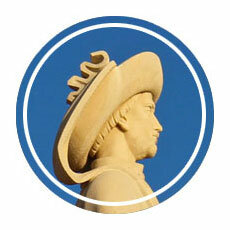 We had to be flexible with our plans, tolerant of the challenges, and open to the unknown. 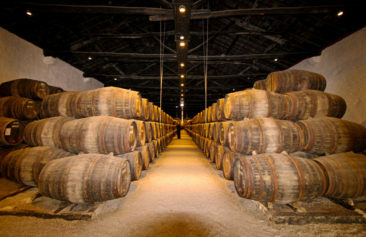 Our efforts were rewarded with a delicious lunch, delicious port, and some great sightseeing on off-the-beaten-path roads. Mostly, though, we found there was a lot to love about a quiet day in Porto. It was the perfect way to begin our new year. Thinking of visiting Porto for New Years? 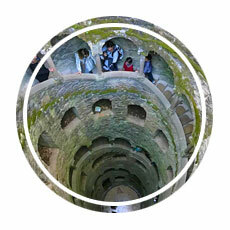 Take a look at these posts to inspire your Portugal vacation planning!